Vijayakanth’s youngest son Shanmugapandiyan is debuting in the lead role in the film titled Sagaptham. Debutante director Surrendran has directed the film. Neha Hinge and Supra are the heroines of the film. Jagan, Devayani and Ranjith have donned important roles. Karthik Raja has composed the music. L K Sathish has produced the film under the banner Captain Cine Creations. The audio CD of the film was released recently at a function held at Green Park Hotel. 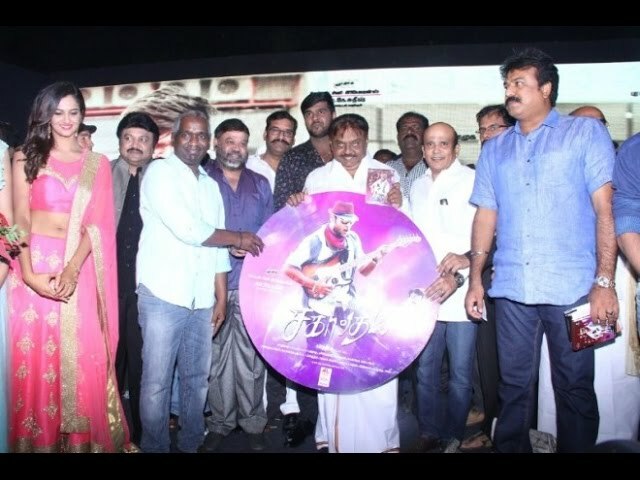 Vijayakanth while speaking at this function said, "I did not force my son to become an actor. I did not give any advice to him. We need not advice anything to these days’ children. They know everything. All will happen according to fate. Nobody can change it. All those who come to act cannot become actors. All those who begin a political party cannot become a leader. People should accept. We should not boast about ourselves. Only others should say about us." Actors Prabhu, Vikram Prabhu, Sathyaraj, Sibiraj, Editor Mohan, Jayam Ravi, P Vasu, Shakthi, Sivakumar, Napoleon, Vaagai Chandrasekaran, Nassar, Power Star, Jai, Karunaas, Vimal, Vijayakumar, Shanmugharajan, MS Bhaskar, Singampuli, directors S P Muthuraman, Kasthuri Raja, R K Selvamani, Parthipan, Pandiarajan, S A Chandrasekaran, Sundar C, Gaurav, Gangai Amaran, K S Ravikumar, Magill Thirumeni and Nalan Kumarasamy attended this function.